Dr. Charles Cao is a professor in the Department of Chemistry at the University of Florida, Gainesville. He is known for his work in the areas of nanocrystal synthesis, assembly, and surface functionalization. 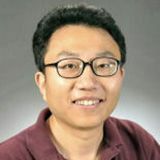 In addition to developing a new way (called non-injection synthesis) of making large-scale quantities of semiconductor quantum dots and metal oxide nanoparticles, Dr. Cao has demonstrated an innovative way of doping quantum dots with position-controlled dopants at Angstrom-scale precision; he has shown how such position-controlled doping correlates optical and magnetic properties. He has invented a fundamentally new class of ligands (called dual-interaction ligands) for making super-stable, water-soluble nanocrystals. Moreover, he has developed a supramolecular approach for controlling nanocrystal assembly into extended superlattices that allows control over the size and shape of such assemblies, which has led to the creation of a class of new superparticles. These nanostructures are being evaluated for their photophysical properties, in energy conversion, as labels in biomedical diagnosis, and as novel vehicles in drug delivery. He has published over 44 papers and extensively in the Journal of the American Chemical Society and Angewandte Chemie. His accomplishments have been recognized with an NSF Career Award and covered in several highlight articles in Chemical Engineering News, Science, and many popular magazines, newspapers and trade journals. His research program is sponsored by the National Science Foundation, Office of Naval Research, and Department of Energy.